This is Stützpunkt 230 and on the first of July 1944 it was occupied by 177 men and officers of a Festung-Stamm-Kompanie, 63 Kriegsmarine Artillerie soldiers and officers of the M.A.A. 608 staff and 36 men and officers of the 5./M.Fl.A. 806. The French fort was built in the 17th century and used the solid granite rock as a foundation. The architect was the famous Vauban. The German geografical survey was completed in the end of 1942 and the first bunkers were ready in early 1943. In july 1944 30 St-bauten were completed. The former bastions of the fort are rather high and in each of these positions, two mg bunkers 105 were built, on top of eachother. On top of the western block three Flak positions remain. 1500 meters of tunnels were drilled in order to interconnect most of the bunkers. The bunkers type 112 and 114 have 6-Schartentürme, for the mg bunkers the Westwall types 105b, 105c and 105d were used. A fire control bunker type 636 and two AA command bunkers of type L410A were constructed. In the middle of the fort an M19 mortar-bunker 633 was built. Just outside the entrance a personnel bunker in the combination of a 501 and 621 remains. A Pak garage 504 served as the communication centre. Finally a Pak-bunker 506 protected the entrance from armoured vehicles. Almost all of the bunkers can be seen from the outside, others are almost invisible. There is a small WW II museum, which brings you somewhat underground, but it is for us mortals simply impossible to visit the underground tunnels. 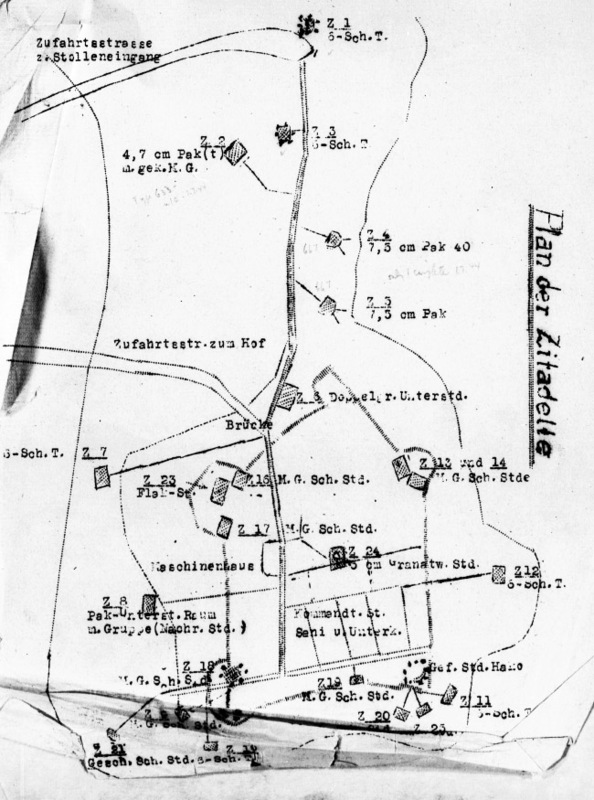 Only because of an anonymous contribution we can show the underground world of "Der Zitadelle". The fierce battle for this strongpoint in august 1944 is still clearly visible, which shows on the cupolas with dozens of impacts. In May 2013 the entrance to the Leitstand 636 was unearthed and in June and July 2014 it can be visited, in commemoration of the 70 year liberation of Saint-Malo.